19th century art lovers had a great appetite for still life paintings of game, fruit and flowers. They liked detailed work and the accurate depiction of natural objects (which was itself fed by the increasing interest in scientific discovery and classification), and they also preferred overall masses of decoration – paintings hung on Morris wallpaper, furniture crowded into rooms, patterned carpets, curtains and upholstery. Flower paintings were the feminine version of the gamepieces deemed suitable for halls and studies; they could hang in the parlours, boudoirs and bedrooms belonging to women. They were also suitable to be painted by women: ‘such occupations might be pursued in the strict seclusion of home, to which custom and public sentiment assigns the fair student’. This was a long-lived genre, extending through the 20th century, changing only slightly in elaboration and style; Camill Göbl continued to produce her large, formal and beautifully-observed flowerrpieces throughout most of her life. They are influenced by artists of the Dutch Golden Age, such as Jan Davidsz. de Heem. Many of them are painted in a single harmony; this particular example is very characteristic of her work, with a basic note of warm reds and pinks, picked out in white and blue. See ‘Flower painting’, V & A website. Camilla Göbl was born in Vienna, and exhibited her flowerpieces, still life paintings and the occasional landscape there from 1896 onwards. She seems not to have left her native city, continuing to show her work until shortly before her death in her nineties. 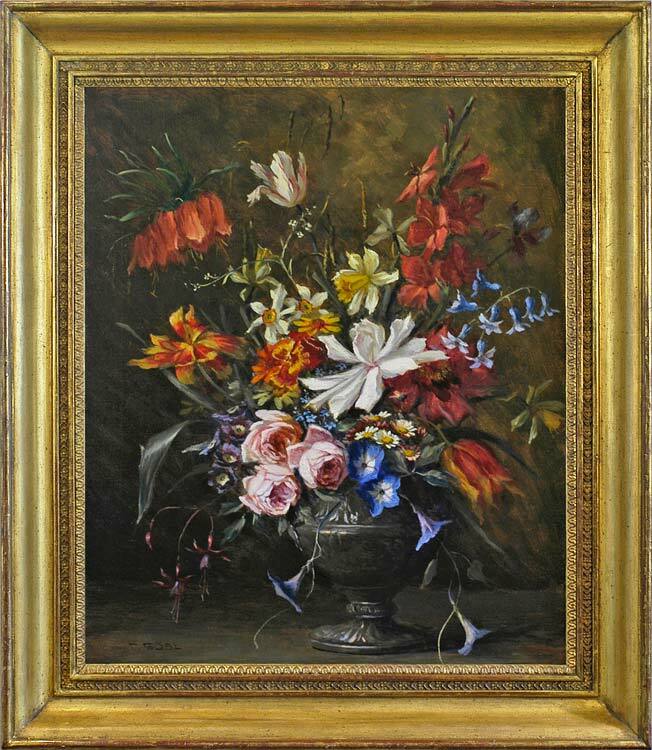 She worked mainly in oils, producing numbers of highly-finished pictures which derive from 17th century Dutch still life artists, such as Jan Davidsz. de Heem; she also painted some lively watercolour sketches, in the style perhaps of Duncan Grant or even of Bonnard. For further reading on flowerpieces, please click here.